Entering a new troop should not be overwhelming. This page is designed to help you sort through the necessary paperwork and make your introduction to Scouting enjoyable. The following forms may be printed, completed and returned to the Committee Chair at your next meeting. 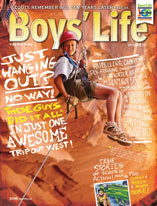 Each new scout is required to complete a youth application to be submitted with your son’s registration fee, which includes the fee a years subscription toÂ Boy’s Life Magazine. It is recommended that at least one parent/guardian complete an adult application. There is always a need for committee members to do boards of review for the boys and assistant scoutmaster’s to assist the boys in achieving ranks. Troop By-Laws/Operating Guidelines should be read by the scout and parent(s)/guardian(s). The By-laws contain information on how the troop is run, and the rules and requirements set by the troop committee. The parent(s)/guardian(s) and the scout then sign the Acknowledgment form and submit it to the troop. The Troop 462 Parental Release Form needs to be completed prior to a boy becoming a member of the troop, which is an agreement between parents and the troop concerning discipline, medical emergencies, and finances. Each Scout must have on file a current copy of their physical and insurance card and a completed Physical/Medical Form, which must be completed each year by a physician and kept current. All adults who will be camping or participating in troop events need to have the same form on file for themselves. Each Scout must have a current copy of the Image Release Form on file, which authorizes the troop to use the Scouts and family members photos on the Troop website and in Troop Newsletters. A Troop Resource Survey form is completed by adults to help us determine merit badge counselors. The Parental Consent Form is required for every trip or activity in which the scout participates. Both parts of this form must be completed each time with updated medical information on the back and is required if the troop is traveling out of council, out of state, or more than 500 miles from home. The Welcome Letter outlines some of the policies and procedures of the troop. Scout Uniform Inspection is a part of the scout responsibilities and this form also outlines the official placement of insignias. Merit Badges is a handy link from National Council that explains merit badges in more detail.